Aimersoft Blu Ray Ripper, from Aimersoft Studio, is an easy-to-use Blu-ray DVD ripping software which enables Blu Ray users to convert Blu ray videos (M2TS format) to high definition formats (H.264/MPEG-4 AVC, AVCHD video and HD WMV) as well as all popular video formats (AVI, WMV, MP4, MKV, H.264/AVC, MOV and more), aiming to let users enjoy their favorite Blu Ray DVD movies on a variety of devices including iPod, iPhone, Archos, iRiver, Creative Zen, PSP, PS3, Xbox 360, Apple TV, Zune, mobile phones and so forth. Aimersoft Blu Ray Ripper normally priced at $45.95. As part of Aimersoft promotion, interested users are now able to download Aimersoft Blu Ray Ripper full version v2.3.0 for free. 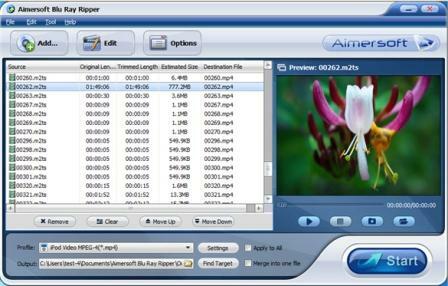 The version 2.3.0 of Aimersoft Blu Ray Ripper is also the latest version of the software available. To grab a free copy of Aimersoft Blu Ray Ripper, just hit the direct download link of Aimersoft Blu Ray Ripper: blu-ray-ripper_full589.exe (9.41MB), without the need of registration nor any license code, product key or serial number. Aimersoft Blu Ray Ripper version 2.3.0 supports Windows NT4, 2000, 2003, XP, Vista and Windows 7 operating systems.